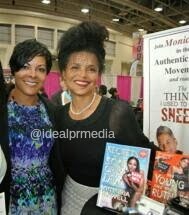 Ideal PR Media caught up with actress and executive producer Victoria Rowell in Washington, DC while attending the Congressional Black Caucus Annual Legislative Conference in Washington, DC. She took some time to speak with Ideal PR Media's TV host Valeta Sutton about her new soap opera (The Rich and the Ruthless on www.indiegogo.com) and published books. See the video below and be sure to support Victoria and all of her efforts. She is the reason the Young and the Restless expanded it's African American viewers and she deserves the recognition and respect.